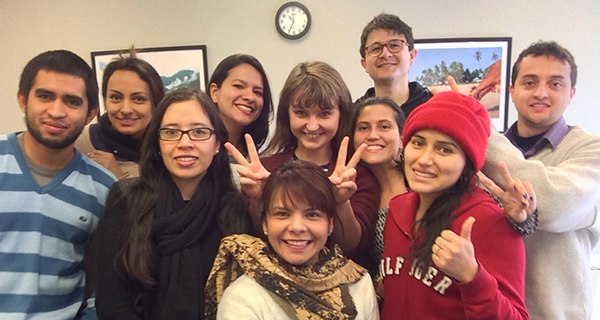 BridgeEnglish in Denver recently hosted a group of university students from Colombia. These General English students, who came from a variety of degree programs at Universidad de Tolima and Universidad de Ibagué, received an academic scholarship from the Colombian government to study abroad in the States for a three-week program. For most of the students, it was their first time leaving Colombia! As students at BridgeEnglish in Denver, the group attended English class during the day, Monday through Friday. In the afternoons and evenings after class, they had the opportunity to meet other students from around the world also studying at Bridge, as well as take part in fun activities and excursions. These activities were not just a chance to meet people and get to know Denver, but to practice their English language skills outside the classroom in a real world context. Some of the activities included visiting the famous Coors Brewery in Golden, Colorado, attending a Colorado Avalanche hockey game at the downtown Pepsi Center, and attending Happy Hour (a favorite!) and English Conversation Club. See other Denver activities here. Though they started out at a variety of English proficiency levels, ranging form A1 (beginner) to C1 (advanced), after just 3 weeks at Bridge, these students were proud to sees a marked improvement in their English level, and many progressed one full level higher upon program completion. Congratulations to this dedicated group of students. We hope to see you back again at Bridge! Bridge offers General English and Business English classes at its centers in Denver and New York, and Academic English classes at these locations as well as 8 partner universities around the U.S.